How many more of these Plants are there after those 2? I figured this sub-topic deserves its own thread. As Hurricane Irma continues to thrash its way over islands in the Caribbean, Florida is bracing for landfall as early as Sunday morning. Two of the Sunshine State’s nuclear facilities are in the Category 5 storm’s path: Turkey Point, south of Miami, and St. Lucie, north of Jupiter, both on the Atlantic coast. Turkey Point withstood Hurricane Andrew in 1992, the last storm to make landfall in Florida as a Category 5, with minimal damage. 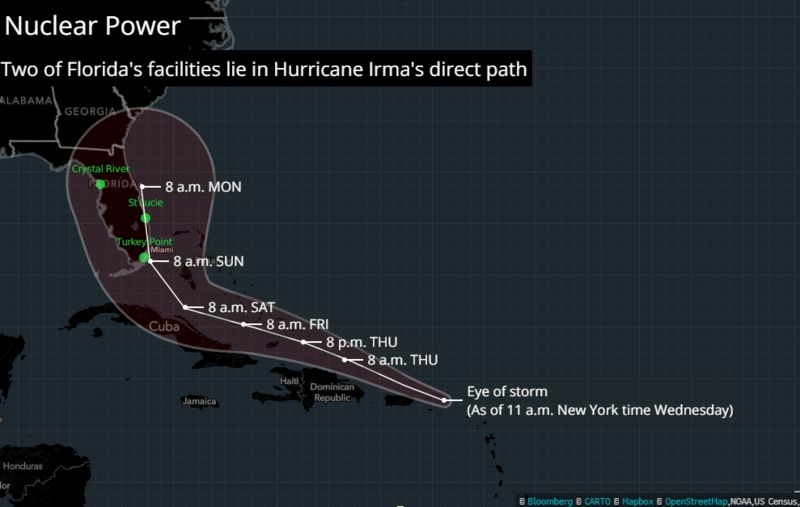 Operator NextEra Energy Inc. will shut the plants "long before" the onset of hurricane force winds, spokesman Peter Robbins told Bloomberg by phone Wednesday. Right now we are thinking about the Turkey Point and St. Lucie nuclear power stations in South Florida, in the aftermath of hurricane Irma. But we could have been referring to the South Texas Nuclear Project south of Houston, just a week or two earlier. Those Westinghouse pressurized water reactors have six modes of operation, sort of like gears in a car. The highest level of performance, mode 1 includes power operations all the way up to 100% power. Mode 6, the lowest level of operation, describes a plant in the state of being refueled. In so-called hot shutdown, a nuclear plant has one primary requirement for ongoing safe operation — a reliable supply of electricity (assuming competent staff of course). Even though nuclear plants produce electricity for the grid, they also require large amounts of electricity to maintain their own operations particularly in this instance for: 1) cooling the fuel in the recently operating nuclear reactor core and 2) cooling the spent fuel pools where used fuel rods are placed after removal from the reactor. These activities are known as residual heat removal. Let’s get something straight. If the zombie apocalypse occurred tomorrow, really bad things would happen at nuclear plants. And perhaps in the surrounding area of say a few thousand square miles. But what would not happen is a nuclear explosion. This is not to deny the potential for explosion. But a hydrogen explosion, a steam explosion and a nuclear bomb type explosion are three very different things. Only the first two have been experienced at commercial nuclear plants. 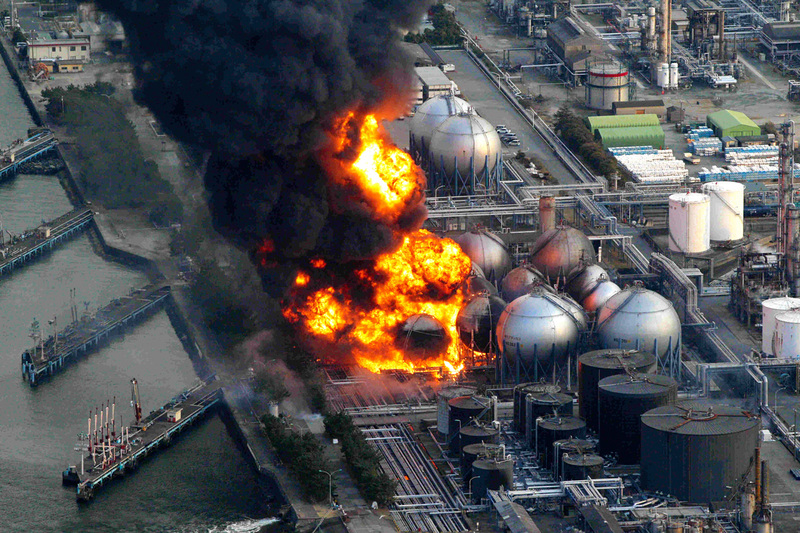 Fukushima Daichi was an unfortunate case of the former (Three Mile Island may have come close) while Chernobyl experienced the latter. Nuclear plants, thus, need considerable amounts of electricity to maintain safe operations around both the reactor and spent fuel pool. Most of the time, the power comes from another electric generating station nearby. But when a hurricane knocks down the electric transmission lines, nuclear power plants rely on large, on-site diesel engines to provide electricity for continued operation. During Hurricane Andrew, a category 4 hurricane which passed over the Turkey Point nuclear power station about twenty five years ago, all the units lost offsite power and relied solely on electricity from diesel generators for more than five days — until electrical connection with the grid was restored. Some variant of this scenario could be occurring, as we write. At the Fukushima nuclear facility, an earthquake destroyed transmission lines, eliminating their offsite power source. The back-up diesels were rendered useless by the subsequent tsunami. The rest is an unfolding tragedy. This is to us the Achilles heel of nuclear power. It takes a lot of electricity to keep all those cooling pumps running and the fissionable materials on site stable. When or if that steady flow of power to the nuclear plant is interrupted, it’s a concern – because in reality, no one can just “shut down” a nuclear plant before a hurricane, though the words are very soothing. By Leonard Hyman and Bill Tilles. Harvey Wasserman’s California Solartopia show airs at KPFK-FM in Los Angeles; his Green Power & Wellness Show is podcast at prn.fm. He is the author of Solartopia! Our Green-Powered Earth and co-author of Killing Our Own: The Disaster of America’s Experience with Atomic Radiation.